This is Little Gem miniature daffodil. It usually blooms for several weeks in February, surviving snow, rain, and sometimes hot weather too. It, with the old fashioned violets which start in late December or January and bloom for a couple of months, start the season for my flowering lawn. Little Gem has a beautiful shape and poise to the flower. Even the dried, dead flower is an elegant shape. It is small, only about 10 inches tall. The ones on the South side started approximately mid-Feb this year, while the East side ones started as those were finishing. 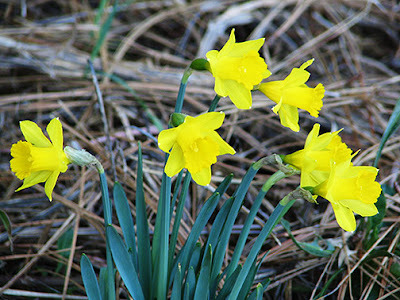 Now, Mar21st, the first day of spring, they are almost done, only a last few flowers. Jenny, another early narcissus on the East side, is getting nearly finished. The Jack Snipes on the South Side are blooming now (Mar 21), and the East side flowering lawn ones are starting.